~I hope everyone came out of this week unscathed. Judging from some of the postings and comments I saw on facebook and twitter over the election results, I have to wonder. Rarely do I ever discuss politics with anyone other than my husband or immediate family members and I really do wish others would refrain from it as well. A healthy level-headed political debate is one thing but threatening to whoop half of America's arse because they voted for the other guy is pretty disgusting. ~Last night when I was reading to Dracen at bedtime, he stopped me mid-sentence to say this..."I know what is bigger than this world but still in it." In case you don't know, Lucky is the Beagle who showed up here five months ago and collapsed bleeding and full of buckshot at our doorstep one Sunday evening. After an emergency vet visit and many dollars later, he seems to have made a full recovery and now believes himself to be a Dachshund. 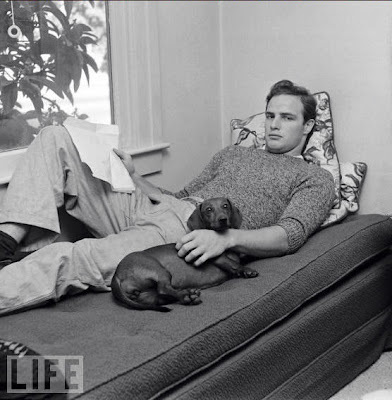 ~Speaking of Dachshunds, I love this old photo from LIFE magazine of Marlon Brando and what was said to be his grandmother's Dachshund. Now this is my kind of eye candy. ~Devin has taken up wrestling at school, staying after for practice every day until 5:00. He pondered it for awhile but told me he wasn't going to do it because he didn't want to wear that stupid thing. (Like mother, like son). Someone must have talked him into it though because he is suddenly all about it (in spite of the fact that he has already injured two fingers on his left hand). The first match is sometime the end of the month, I believe. My mind immediately went to the Diary of a Wimpy Kid movie when Greg was forced into wearing the singlet in p.e. class. But if you ever tell Devin I said that, we can no longer be friends. ~And speaking of things that make me laugh... Devin came home from the mall several weeks back and hung this poster on his wall, above his dresser. I had no idea who the kid even was. I was informed that he is a rapper named Wiz Khalifa. I am so out of the loop. But dear Lord, I cannot help but chuckle every time I look up and see this guy's smile..."Heeeyyy!" ~I'm not a big perfume kind of person since most of it just gives me a headache but I tried one from a sample I got awhile back and I do believe I have found my new signature scent...kind of like Shelby's signature color in Steel Magnolias... "My colors are blush and bashful. Pink is my signature color!" All roads seems to lead back to Steel Magnolias in my world. 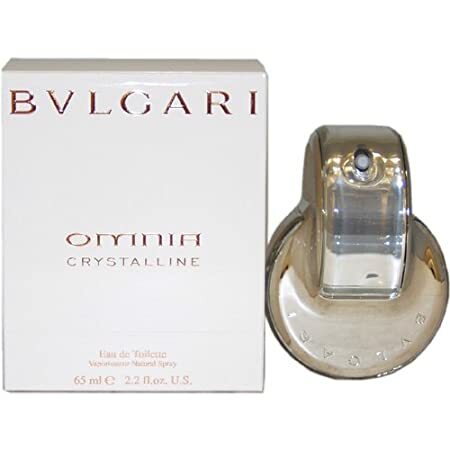 Thing is, I can't really say "Bvlgari Omnia Crystalline is my signature scent" because I have no idea how to pronounce Bvlgari. It sounds fancy but it is really a more mellow, subtle scent if that makes any sense at all. Like I said, I've never been a big perfume user so I'm out of my area of expertise here. ~In case you're into clothes and sales as much as I am, the Loft is currently having a 40% off EVERYTHING sale, online and in stores and Old Navy is offering 50% off all outerwear. Show Dracen a few pictures of cauliflower ear and he'll be reaching for that headgear the moment he wakes up! Thank you for the reminder on Old Navy 50% off - I saw a coat I wanted there but knew a sale was coming! Was it the head gear or the "onesie" to which Dracen was objecting? The stick figure cartoon is going for a re-post on Cafemom! Popped in from Friday Fragments. That was a very nice dog story. Long time lurker. I love hearing about your life and your boys! I have stick figure stickers under duress. But maybe I'm glad because I blogged about it and it was featured on BlogHer! Hope Devin is safe while wrestling, never understood that sport. Okay, I really do not understand most sports... I am so not sporty. Have a great weekend. Those stick figure things on the back of your vehicle are HUGE here in Alaska!! My hubby was a wrestler as well, my home state is huge into wrestling! I am so glad you guys were able to save that dog! What on earth are people thinking?? Awwww...that was one sweet response! PS. I did not know that Marlon Brando was actually kind of hot. My hubby was a wrestler in high school way back in the dino era! HA! Even ended up placing 3rd at State, thank you very much. However, one thing I can't stand is those singlets...ugliest uniforms I do believe I've ever seen! BLECH! Yes, I couldn't believe the rudeness over the election results! I wanted the other guy to win but I wasn't rude about it :/ I was called stupid a number of times for wanting Romney to win and I was like "Um, really? We've resorted to name calling now?"